Internet Explorer 8, Internet Explorer 7, and Internet Explorer 6 will by default remember all passwords you enter inside login forms (like Hotmail Sign in to check your email account), but it is easy to inadvertently disable this functionality, and Internet Explorer will from that point on no longer offer to automatically remember your passwords. But, fortunately, this is a setting you can turn back on at any point, as you'll learn in this tutorial. Under the section of options labeled "AutoComplete", click on the "Settings" button. To make Internet Explorer automatically remember your credentials in sign in forms, check the "User names and passwords on forms" checkbox. This tells your web browser that this setting should be turned on. 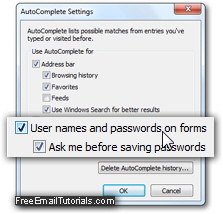 The indented checkbox below reads "Ask me before saving passwords" - if it is checked, Internet Explorer will always display a confirmation dialog before storing a user name and password for the current login form, and only save that password if you click Yes - otherwise (if you click No), it will not remember your user name and password this time, and not ask you to either in the future, when you go back to that particular website to sign in to your account (in other words, you'll need to manually enter and type your credentials every time for that site and form). Once you have finished configuring your password settings for Internet Explorer, click on the OK button to return to the main Internet Options dialog, and click OK from there too to return to your browser. This is how easily Internet Explorer lets you reset the remember-passwords option!